In 1799, at the age of 26, George Cayley developed the concept and came up with a design for what is considered the first modern airplane. December 27th, 1773 is an important date in aviation history. This was the day that Sir George Cayley was born. George Cayley has since been called both ‘The Father of the Aeroplane’ 1 and ‘The Father of Aerodynamics.’ So, what exactly did he accomplish to garner such grand titles? In 1799, at the age of 26, George Cayley developed the concept and came up with a design for what is considered the first modern airplane. His design contained a fixed main wing, a fuselage, a tail unit with horizontal and vertical control surfaces, a cockpit for the pilot, and a basic means of propulsion made up of revolving vanes. These revolving vanes served as a precursor to the propeller. George Cayley’s first modern airplane design. Over the next decade he also developed many aerodynamic theories. This culminated in 1809, with the release of a landmark, three-part scientific study titled “On Aerial Navigation”. This work, among other things, identified the four forces of thrust, lift, drag and weight at play on an aircraft. It also described and detailed the importance of a cambered aerofoil, dihedral angle, and bracing in wing design. And finally, it provided a greater understanding regarding the design of ornithopters and parachutes. 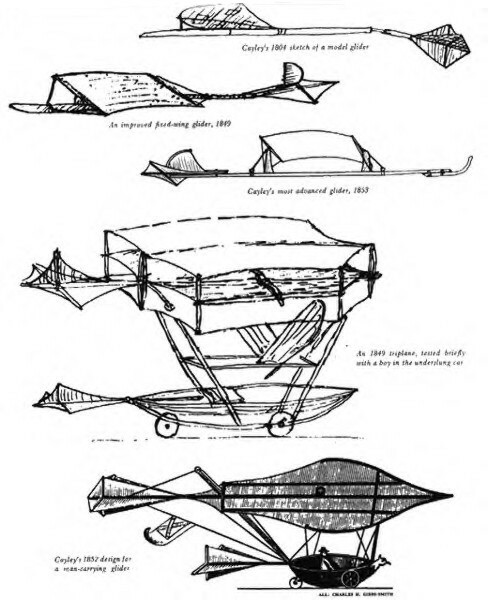 A progression of aeroplane designs by George Cayley. 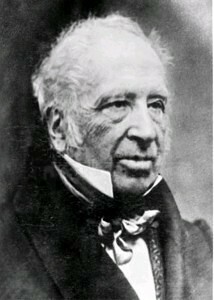 Though George Cayley was not focused exclusively on aviation for his research and inventions 2, he continued to devote much time and effort to aviation. In 1849, he made another breakthrough. He built the world’s first functional, full sized glider. And, using a 10 year old boy 3 as his passenger, conducted the world’s first successful heavier than air flight. Four years later, in 1853, he developed a larger scale glider which successfully flew an adult male 4 900 feet across Brompton Dale. George Cayley also pioneered the concept of a wheeled undercarriage. He also correctly predicted that sustained flight would not be possible until a lightweight engine could be developed that could provide sufficient thrust and lift. George Cayley didn’t live to see his goal of sustained heavier than air flight realized. But his contributions to aviation were acknowledged by the Wright Brothers as directly contributing to and influencing their own momentous achievements. 1 George Cayley was first referred to as ‘The Father of the Aeroplane’ in 1846. 2 A prolific inventor and accomplished scientific researcher, Cayley designed many important items. Among his inventions are the tension-spoked wheel in 1808, which is still used in today’s modern bicycles; and seat belts, which he first developed as a way to promote safety in railway carriages. 3 This boy, unnamed, and unknown to history, is reputed to have been the son of one of Cayley’s servants. Whoever he was, he became the first aviator in the field of heavier than air flight.